The Fellowes 485Ci is a Large 4x30mm Cross Cut office shredder that will also shred CD's/DVD's, Credit Cards, Paper Clips and Staples, as well as continuous full width computer printouts. It features high performance engineering with a heavy duty motor, which provides continuous use for multiple users in a small department. 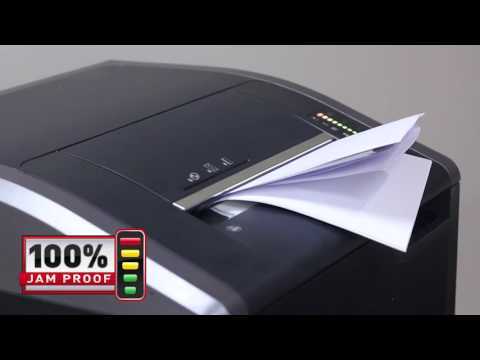 The Fellowes 485Ci is 100% Jam Proof and will auto-stop and reverse when too much paper is inserted into the entry throat. A colourful visual indicator shows the shredder capacity. The Fellows 485Ci features an easy to clean auto oil mechanism to keep your shredder running at maximum performance. Continuous Duty Shredding technology also allows for the continuous shredding of paper, with no gaps between passes, for 24 hours without the motor over-heating. The Fellowes 485i model also features Safe Sense Patented Technology that stops the machine automatically if the entry throat is touched offering ultimate safety in the office environment. The use of a P-4 shredder such as the Powershred 485Ci will aid your GDPR compliance.